Here is the front of my brand new business card. The back is just as colorful, continuing the tree's branch into its trunk, and provides all my personal information. I had them made, by the ever-talented Leeza, for the NJ SCBWI workshop I am attending the end of this month. 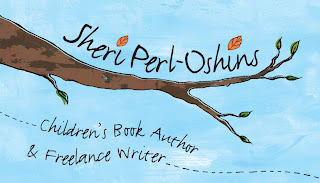 Leeza's feelings on business cards for children's writers/illustrators, and I couldn't agree with her more, is we can stand to be more colorful and creative then say... a lawyer's business card. After all, you want your card to stand out and be memorable to an editor, publisher, or agent. And now I must write this, or I'll never do it... I am relatively new to blogging. And in this very short time, I am hooked! It is instant gratification. You write things, others read it, and let you know how it affected them. It is, very simply, a dangerous drug for writers. So I need to step back. I have been in a bit of a writer's slump lately, and this addiction is not helping matters any. I need to regain balance. So I feel if I say this here and now, tomorrow (...wait... it IS tomorrow...) will be a much more productive day. So I am returning to blogging, and checking all of your wonderful blogs, twice a week. I am going to strive for Sundays and Thursdays, and I know it will be hard to break the gravitational pull I feel twards posting, reading, and commenting, but I MUST return to devoting the majority of my week to what I am devoted to - my MG novel. "I am hooked! It is instant gratification. You write things, others read it, and let you know how it affected them." So true. I'm addicted too! Though, I'm not sure if it harms or helps my writing. I know what you mean. I just started last month and it does take time away from writing. I find it more fun to look at blogs when I sit down at the computer than to actually work on my projects. I think I'll take your advice and only check on specific days. Good luck with your MG novel. Hey, at least blogging IS writing. So it's okay, isn't it? Oh, okay, my name is Rebecca and I'm a blog addict. Oh, I'll miss you. But I love the cards! If you want to see some more intresting samples for business cards go to http://www.dcp-print.com I found them very attracive. I had to take a step back from the blog, too. That instant gratification is a sweet, sweet drug. Hey everybody. Wow this is hard staying away! I am going through withdrawal, so I thought I would at least check comments and reply to those, but cut myself off from there. Becky, I thought that was you at the last BA meeting (Blogger’s Anonymous). Liat, welcome! I checked out your site - neat cards! Sarah, Hi! Actually it was you who made me admit I had a problem. I read your last posting or so, when you said you needed to kind of step back and take control and you needed to spend more time writing. Guilt set in from across the Internet Galaxy and I said, I must do the same thing. I have been on Chapter 5 for like two weeks now - ridiculous! So it's a thank you to you! hahaha, I knew you couldn't keep away. Commenting is cheat-blogging, isn't it Shez? Anyhoo, I too had to cut back to twice a week. Although, I have been a sporadic blogger here and there during the past couple of years — kinda like on-the-blog-wagon-off-the-blog-wagon. I feel like I am all blogged out after the SCBWI weekend, but then again, deciding to do twice a week, makes me feel more eager to commit, somehow. My twice-weekly fix for my addiction. Rather than posting every day, I can plan ahead, which seems managable, donchya think? Now my current addiction? Checking my Web stats every hour to see if an AD has visited my site yet and simultaneously checking my e-mail to see if the same AD has contacted me for a book deal. Be warned there are no highs with this current addiction … and yet I still come back for more. Really enjoying your blog, so keep up the fantabulous work! I really hope you're feeling better! My kids got the flu, and bad. Rest up, and only post when you're ready. these are so cute simple for business cards..thanks for sharing it as i might need it when design my own plastic business cards..